You are here: Home » It’s Not Me, It’s My Hormones! In a book published in 2000, scientist James M. Dabbs described testosterone as the hormone of “heroes, rogues and lovers”. Oh yeah, that’s me. The hormone has also been attached to risk-taking. OK, still like me. I think I take risks worth taking. Now they have determined that men who like spicier food also have higher levels of testosterone. In a recent French study (titled “Some Like It Hot”), 114 men were followed to follow their behaviors and track testosterone levels. They postulate that people with higher levels of testosterone strive for greater risks, and that includes trying increasing levels of spicy foods. There is also speculation that the accomplishment of spicy foods might reap a social reward which may drive levels of testosterone higher. So when I sit down at a Thai restaurant and tell the server that if my eyes don’t water, it is not hot enough, it is not me, it’s my hormones! These great sandwiches have some flavor and just a little heat. 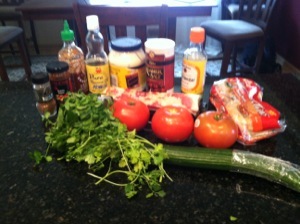 A variety of ingredients here. I used thin buns for the base. 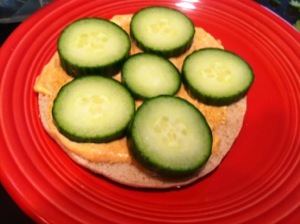 Apply some of the chile mayo and some cool cucumber. 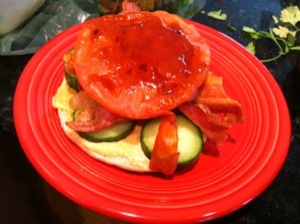 Bacon and tomato with hoisin. 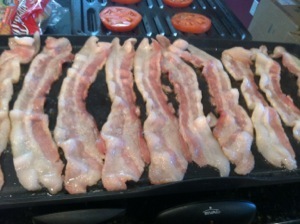 Working in batches, cook the bacon in a large skillet over medium heat until crisp; drain on paper towels. Sprinkle the bacon with the five-spice powder, then break the slices in half. Preheat the broiler. 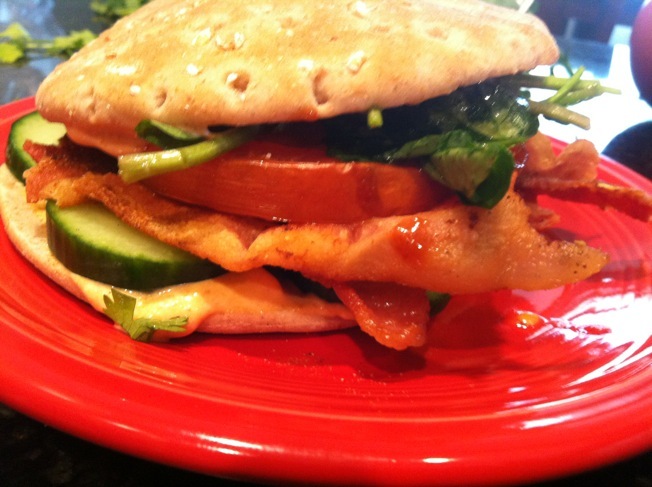 Place the tomato slices on a baking sheet and brush with half of the hoisin sauce. Broil until bubbling, about 3 minutes, then turn; brush with the remaining hoisin sauce and broil 3 more minutes. Combine the mayonnaise and Sriracha in a small bowl. Toss the watercress and cilantro in a medium bowl with the vinegar, sesame oil and a pinch of salt. Dampen 2 paper towels and squeeze out the excess water. Wrap the Chinese buns loosely in the paper towels, then place in a large microwave-safe bowl; cover with plastic wrap and microwave in 30-second intervals until hot and soft. (Alternatively, steam in a steamer basket set over boiling water, 5 minutes.) If using hamburger buns, do not steam. Spread the inside of the buns with some of the chile mayonnaise. 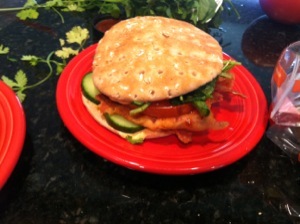 Fill the buns with a few slices each of cucumber, bacon and tomato, and some of the watercress mixture. ← Live from New York, It’s Saturday Night! I particularly like the spicy mayo ~ nice!